Debbie and I mentioned to her that I’d like to go and visit the Bishop Museum on one of the days that we were there…so we did. 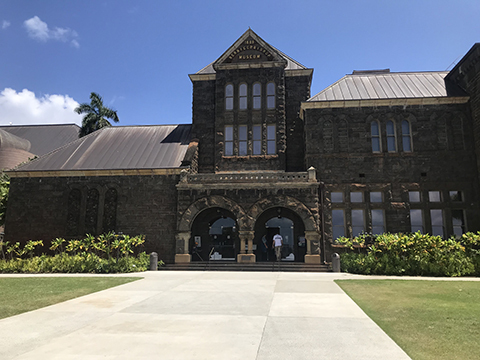 My father attended school here in the very early days of the Kamehameha school system before it would be turned into a museum. You had to be of native Hawaiian ancestry to attend, which still is a requirement to this day. The school would later be relocated to a hill just above the original site. worth the price. There’s a lot to see, learn, and explore about Hawaii’s rich culture and the Pacific as a whole. They also feature different exhibitions throughout the year…right now they have a dinosaur exibition. memories of when I used to come visit and just trip around as a kid. As an adult, I have a new found appreciation for the great work that they do here. One of the must see things to do when you’re there is to take in the Watumull Planetarium show. The one we saw showed how the early Polynesians became the greatest oceanic navigators in the world. They sailed all over the Pacific Ocean using the stars and ocean currents as their navigation. Just mind boggling as to how they figured out their own system of navigating…you’ll be amazed! eventually be imprisoned and overthrown by the United States of America in 1893. There is a very good book out there that details the history and events leading up to how this all went down. It’s entitled, “To Steal A Kingdom” by Michael Dougherty. It was one of the darkest days in the history of Hawaii. To this day the native Hawaians are still pushing and hoping for a sovereign Hawaii nation. story goes that my great grandfather was the one who took the Queen’s assets to Japan for safe keeping. this unique and informative place…You won’t be disappointed!